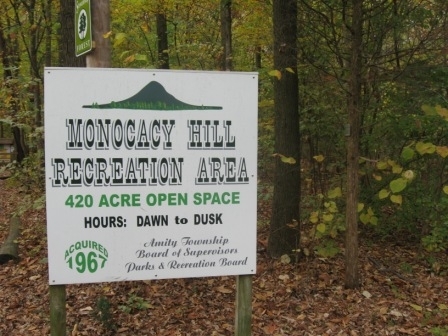 After reading the description of Monocacy Hill Recreation Area in the Penn State study, I was both excited to visit and surprised I had never been there before. I enlisted the help of a friend and her kindergartener to explore this huge place. Before we left, I made up a small scavenger hunt to take to the park, something I have done with my kids before. It’s nothing fancy, just a few simple things for the kids to find on a hike, and now they can find them and take photos with the digital camera, which makes it even more fun. BASICS: Plants, insects, animals taken out of their natural habitat may not have the natural predators and diseases that previously kept their population under control. So they are able to aggressively compete with native species for space, light, water and nutrients and spread through the forest displacing our native species. In our area, for example, deer will browse on native plants and rarely eat non-native food sources. 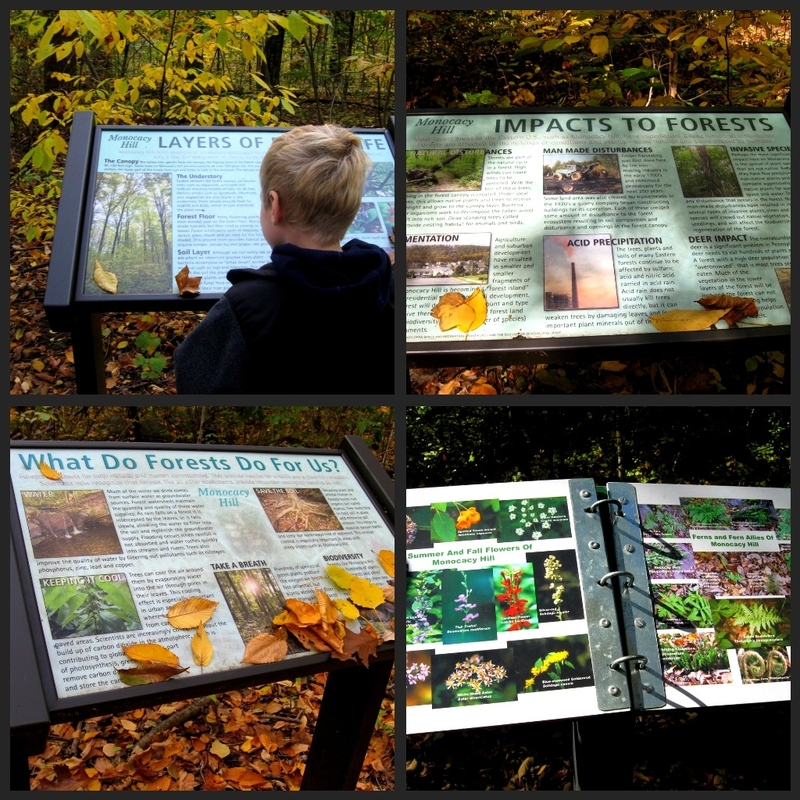 This recreation area is like “park meets museum,” because there are informational stops all along the path and many of the trees and shrubs are marked with the species, origin, and more. 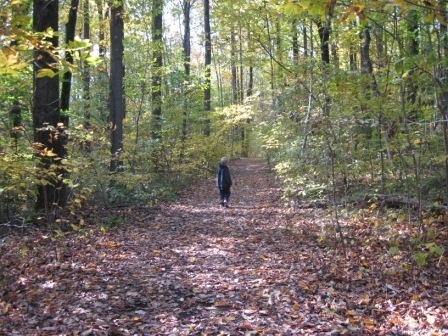 It certainly makes for more than just a walk in the park when you visit Monocacy Hill. We set out on our way after a quick stop at the restroom (an outhouse-not fancy, but definitely a convenience especially if you’re taking a long hike.) 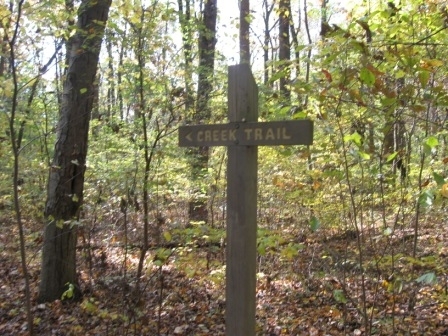 We saw a sign marked “creek trail” and decided unanimously that we wanted to see the creek, so we started on the path. Our young explorer started immediately on his list and was very selective in what he chose for each of his scavenger hunt items. He didn’t take a photo of the first thing he found for each category; he wanted to be sure about his choice. The path wound its way downhill and the scenery was breathtaking. I already love fall and all the colors it offers, but there was something special about this particular place and the sheer height of the trees. 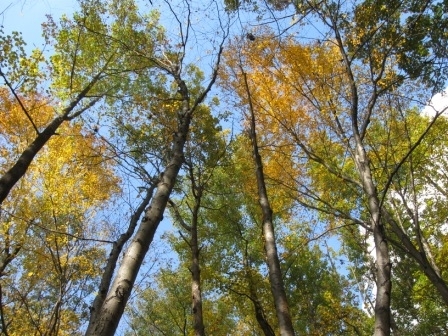 There was a light wind that would make the canopy sway and leaves of all shapes and colors made their way down to us. 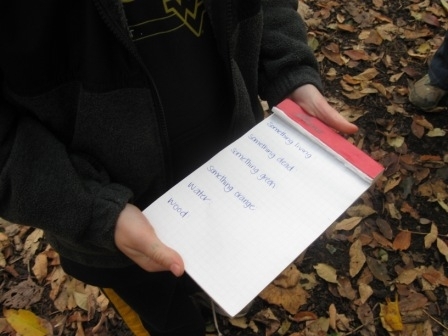 The scavenger hunt was on – a log with moss was selected as something green, living and wood! Next up was a pile of leaves that were obviously dead. A striking orange, red and yellow leaf fit the bill for something orange, and the hunt (and hike) continued. 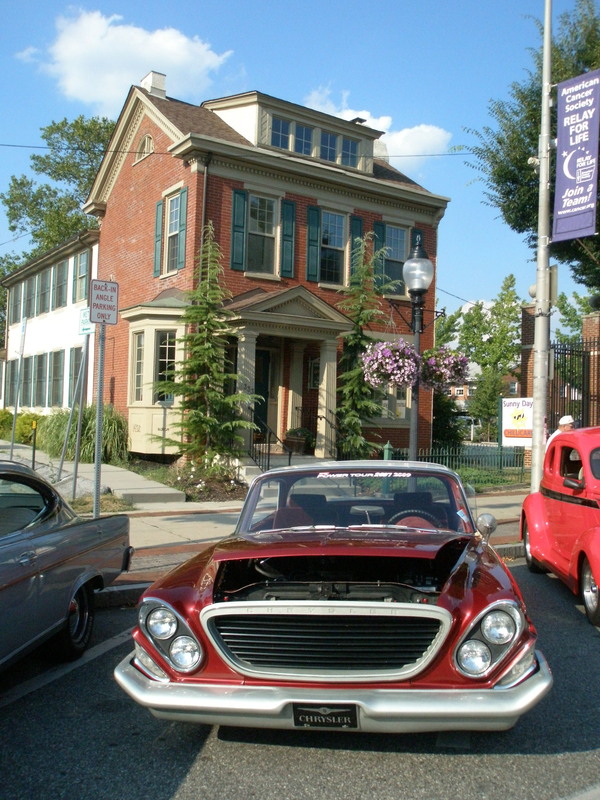 By then point, I was already planning my next trip to Monocacy Hill and wondering how soon I could get back here with my kids and husband. 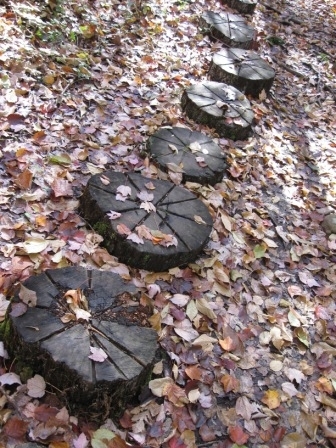 The path, which to this point had been a mixture of mud, leaves, gravel and some medium-sized rocks (which our scavenger hunter astutely told us meant we were nearing the creek) now turned into carved stumps. We were all thrilled as we forged ahead in pursuit of the creek and the rest of the scavenger hunt. As we passed another hiker with her dog, the path changed again, to boardwalks, and soon we found the creek, followed by shouts of “water!” and a request for the camera to check one more item off the list. After passing the creek, we walked a bit further and then realized we had made a rookie mistake. In our enthusiasm to see the creek, we hadn’t looked at the map of the park trails! We had to decide whether to keep going and see if our path would circle around (which it didn’t seem to be doing) or to double back and retrace our steps. If we had unlimited time, I think we would have kept going, even not knowing what was ahead, but afternoon kindergarten awaited our scavenger hunter so we turned around. 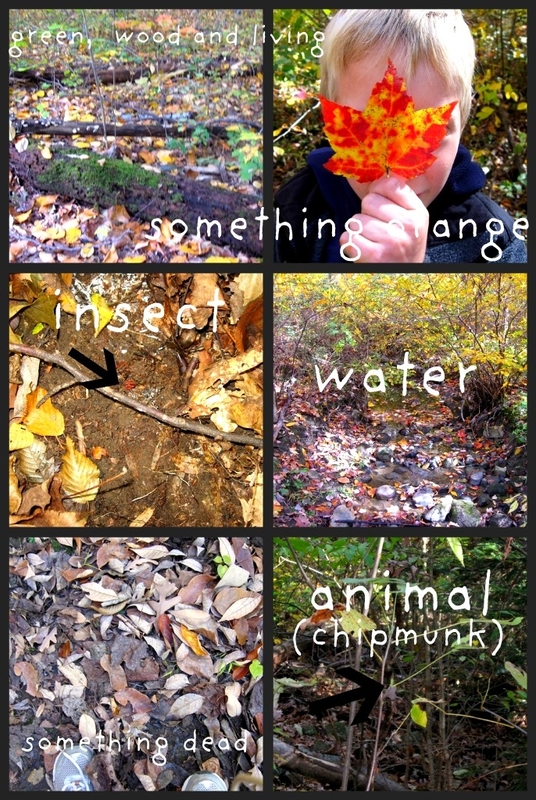 Amazingly, the two hardest items on the scavenger hunt to find were the animal and the insect. My friend bravely turned over a log to uncover a characteristically gross specimen of insect, and we finally found a chipmunk to satisfy the animal requirement of our list. We followed the creek trail back up the hill and toward the entrance where we (finally) read the map. If we had gone just a bit further, our trail would have merged with another one and wound its way back to the main entrance, but there’s always next time. Of course, you absolutely do not have to wait until a scheduled event to visit the Monocacy Hill Recreation Area. Thanks to the well-marked trails and the information spots scattered throughout the park, any day is a great time to have an adventure here. 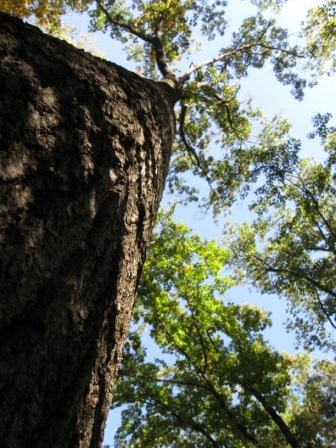 Suitability: Anyone can enjoy connecting with nature at this beautiful park. Some of the trails are more challenging and would be tough for people with limited mobility. 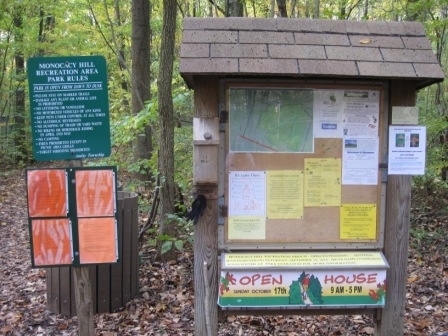 Check the map before heading out on the trails. Know your own physical limitations when you start the hike. Activities and tips: Check out the trail map before you go so you can choose how long you want to hike. There are short trails of a mile or less; for the more adventurous, hike the entire perimeter! Wear comfortable shoes and bring a water bottle, especially if you are taking one of the more challenging trails-these paths are natural and include stumps and boardwalks as well as stones and gravel. 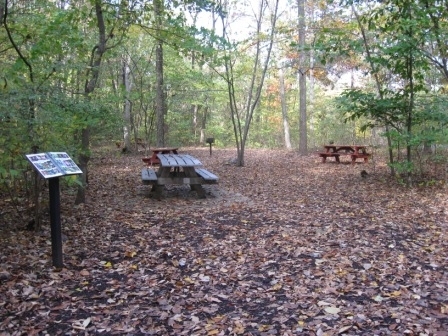 If you pack a lunch or snack, there are picnic tables near the Geiger Road entrance to the park.